Replant disorder or replant disease refers to the problem of re-establishing plants in soil where the same species was previously grown. Roses are particularly prone, though it can affect other trees and shrubs. Replant disease is a recognised but poorly understood problem. It occurs when a plant is replaced with the same type. For most plants this does not cause a problem. However, for others, most notably roses and others in the rose family, the new plant fails to thrive or put on decent growth. The roots of the previous plant need only to have been in the soil for a few months for the problem to occur. The problem varies in severity and sometimes does not occur at all. An indication can be obtained by test planting several plants of the same variety in both the soil in question and in other soil which has never grown that plant, and comparing vigour over the first one or two seasons. For roses, a comparison in pots over one season would probably be sufficient. If the problem occurs, lift the plant, shake off the soil and replant in another site where the species has not been grown before. The plant will often recover. STEP 1: Swap the soil with fresh soil from another part of the garden. 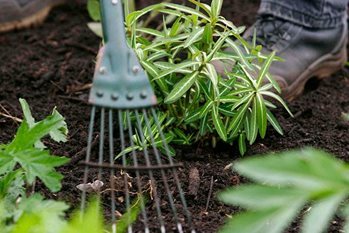 The soil should be removed to make a planting hole that is a few centimetres larger than the full spread of the roots. This is usually about 60cm (2ft) diameter and at least 30cm (1ft) deep. STEP 2: Some gardeners have used a cardboard box with the bottom removed to line the hole; by the time the cardboard rots away, the plant has established. STEP 3: Boost plant growth by applying fertiliser high in nitrogen, such as sulphate of ammonia or hoof and horn. STEP 4: Mycorrhizal products are claimed by the manufacturers to be effective in counteracting replant problems. These usually come in a sachet and can be sprinkled into the planting hole. STEP 5: Place the plant in the ground. Improve soil structure by incorporating some well-rotted manure or organic matter into the back-fill soil and firm this around the roots. Water well. Resistance: some rootstocks confer resistance. Roses on Rosa 'Laxa', apples on M27, cherries on 'Colt' and plums on Myrobalan B show more resistance than those on other commonly used rootstocks. Roses on Rosa canina and flowering cherries on Prunus avium are more susceptible. No chemical soil sterilants are available to home gardeners. Soil sterilisation by steam is possible, but difficult and expensive to organise. This problem is well known in apples, where is has been called "specific apple replant disease" and roses, where it has been known as "rose sickness". It is believed to be caused by a build-up of soil pests and pathogens during the life of the first planting. Fungal root diseases and nematodes (eelworms) are favourite suspects. Because levels build up gradually over the years, populations do not reach high levels until the first generation plants are mature and robust enough to tolerate them. However, when the land is replanted with young plants, the small root systems encounter a high residual population of pathogens or nematodes and struggle to establish. The problem can persist for at least nine years following removal of the first planting. The best evidence in favour of this theory is that the problem is eliminated by soil sterilisation, suggesting a biological cause. Although traditionally believed to affect only the previously planted species - apples are affected following apples, but cherries following apples are not - more recent evidence suggests the effects are more widespread. This would be understandable if a build-up of soil pathogens and nematodes was responsible, because most of these are not specific to individual plants.